Gorilla FAQ: Answering the most common questions | Dallas ZooHoo! Dallas Zoo Lower Wilds of Africa keeper Debbie Reid answers some of the most common questions about the Dallas Zoo’s two gorilla troops. How much do the gorillas weigh? 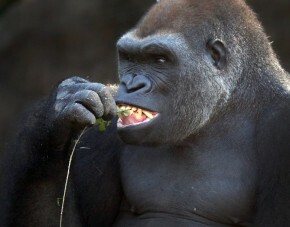 Our gorillas’ weights fluctuate and several are not at their full adult stature (especially our bachelor troop males). Do you ever go in with the gorillas? The answer to that is a resounding NO. The gorillas are too large and too strong for staff to enter an enclosure with them. Even roughhousing gorillas can cause serious injuries to humans. In the morning before the Zoo opens when the gorillas are still in their night quarters, keepers go into each habitat to clean, scrub, mow, trim and put out the morning portion of their diet. The night quarters are cleaned during the day when the gorillas are out. The only physical contact the keepers have is during training sessions for health checks and body part presentation. And that is still done with a secure barrier between the gorilla and keeper. Do the gorillas spend the night in the habitat? At night, the gorillas come inside, where they are fed and where they make their night nests. What do the gorillas eat? They eat a lot of fresh fruits and vegetables daily. The bulk of their diet consists of romaine, curly leaf lettuce, kale and celery. They also get a variety of fruits and veggies like apples, oranges, pears, bananas, grapes, broccoli, onion, sweet potatoes and carrots. And they receive seasonal treats like plums, peaches or watermelon in the summer, and pumpkins, squash and sugar cane in the fall and winter. The variety keeps the animals excited for meal times. Do you bathe the gorillas or brush their long, soft-looking hair? Gorillas groom themselves to remove loose hair, dead skin, hay or grass. There’s no need for zookeepers to do any grooming. What is the life expectancy of a gorilla? Female gorillas in human care tend to live to their mid-40s to early 50s, and males tend to live to their late 30s or early 40s, but some may live even longer. This is why it is important for us to make sure their lives are enriched through training, food, browse and objects to manipulate. Do you have any baby gorillas? We have two troops of gorillas, each with their own habitat. Our bachelor group consists of all males 13-14 years old. Our family group has one adult male and two females. They don’t currently have any babies, but we are hopeful this group will have a bundle of joy some day! It’s said that they are at least 10 times stronger than an adult male human! This is another reason for keepers to be respectful and cautious while working with them. How do you tell the gorillas apart? To us, the gorillas differ as much as humans do. Each has its own distinct body type. Males outweigh females by at least twice their body weight and their heads are much larger. Their facial features are completely unique. It takes a bit of time watching them and it becomes second nature telling them apart. Keepers are even able to tell who is who by the way the gorillas walk! Do your gorillas know sign language? They don’t know sign language, but we use hand signals to ask for behaviors during our health check training sessions. 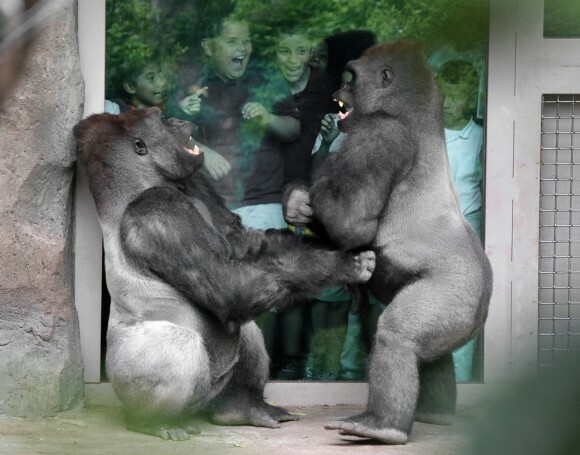 See the public training demonstrations for yourself every Saturday and Sunday at 1:15 p.m.
With a troop of males becoming silverbacks, there are times when aggression and injuries occur as they figure out their social status. This is natural behavior, and occurs in the wild, too. For the most part, our troop gets along really well, but just like people, they have good days and bad. We are constantly monitoring our animals and our vet team is always alert if an injury occurs. Thankfully, animals have an amazing ability to heal quickly and naturally. What is the biggest threat to gorillas? Although we’re not often asked how gorillas are doing in the wild, keepers like to turn the tables and ask the public if they know who is the biggest threat is to gorillas. The answer is man. Due to mining, meat trade, poaching and habitat destruction, gorillas have never been at greater risk. You can help at home by recycling cellphones, caring for the environment and donating to gorilla conservation causes. Come visit us and see our wonderful gorillas in the Wilds of Africa! We love visiting the gorillas! We’ll be at the zoo this weekend for Safari Nights and I’ll definitely being sharing some of these facts with my kiddos when we head down Gorilla Trail. 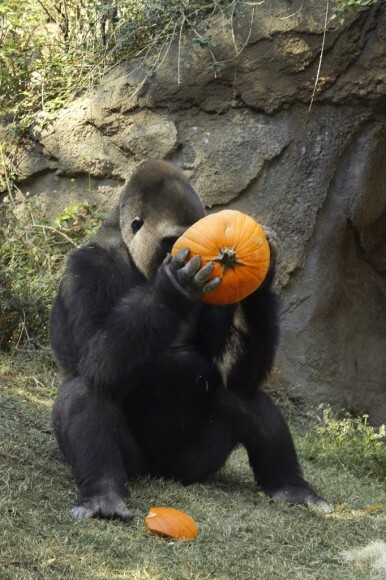 Great information about gorillas and specifically “our” gorillas at the Dallas Zoo. We love watching them to learn their different personalities. They were extra playful on a recent rainy day!